When you are ready to build your own fantasy world, you might consider these four things: tone, magic, language, and the concept of the archaic (found in posts today, yesterday, and tomorrow). Continuing the concept of magic . 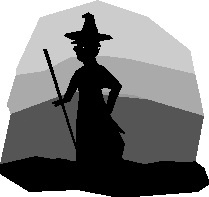 . .
Christianity, in earlier centuries, saw witches as wielders of power which they obtained by pacts with Satan. Harmful as they were, witches had no power of their own. In many dark fantasies, the searcher after power obtains his heart’s desire from some greater being who is, in essence, a Satanic stand-in. Such Faustian bargains never end well. Well, almost never. Martin does turn the tables on Satan in Robert Bloch’s That Hell-Bound Train. Magic, in fantasy writing, often goes unexplained. The talisman in The Monkey’s Paw is understood by the reader without elaboration, just as a reader of westerns doesn’t need an explanation of how a six-gun works. It is equally usual to concentrate on the education of a wizard, or mage, or dziai. Ged went to Roke, Harry Potter went to Hogwarts, and my Tidac took two books to learn how to use his power because he had no mentor. His father never learned, and it destroyed him. Can we have fantasy without magic? Probably not. Pavane is an alternate universe science fiction or an alternate history novel, but its tone makes it read like fantasy, except for the absence of magic. What seems to be magic in one chapter, may just be a dying dream; it isn’t made clear to the reader. For me, this places Pavane on the borderline between genres. I know that my Menhir story, in its infancy, before I really knew what it was going to be about, read like a quasi-medieval world. Slowly I came to grips with how the powers of every soul are affixed to menhirs at death, making menhirs into gestalt beings which become repositories of power that can be tapped, at peril, by men of power. Only then did magic come into the world of the menhir. And only then did it begin to read as fantasy. This entry was posted in A Writing Life and tagged fantasy fiction, language, literature, science fiction, writing on June 13, 2017 by sydlogsdon.